The IBM WebSphere Dynamic Process Edition is a comprehensive set of role-based, SOA enabled product capabilities providing customers the ability to continuously optimize processes and adapt them to rapidly changing needs. This IBM Redbooks publication addresses the configuration, administration, and security of the key runtime environments in WebSphere Dynamic Process Edition: IBM WebSphere Process Server, WebSphere Business Services Fabric, and WebSphere Business Monitor. Through a series of step-by-step instructions you will learn how to select and create a production topology environment based on WebSphere Process Server deployment environment patterns. You will learn how to secure this environment and administer it. This book also contains a chapter on extending existing production topologies to add components such as additional clusters. 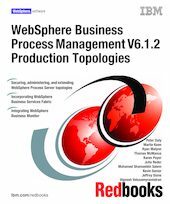 This Redbooks publication also provides practical examples demonstrating how to incorporate WebSphere Business Services Fabric and WebSphere Business Monitor into existing topologies. The book contains extensive examples of working with all of these products in distributed environments. A separate publication covering z/OS is forthcoming.